PINK RIBBONs, INC., directed by Léa Pool, written by Patricia Kearns and Léa Pool; based on the book by Samantha King. Statistics show that every 23 seconds a woman is diagnosed with breast cancer, and one dies every 69 seconds from the disease. Director Léa Pool filmed events in the Susan G. Komen Walk-for-the-Cure during Breast Cancer Awareness Month (BCAM), held in major locations around the world. AstraZeneca, a corporation that produces cancer-causing chemicals and drugs, founded BCAM, which takes place annually in October. Watching the film, the preponderance of hot-pink EVERYTHING got to me—from the twisted pink ribbon to pink flamingo glasses. Nowadays, you can’t turn around without a proliferation of pink products being pushed at you. Pool interviewed social commentator Barbara Ehrenreich. Diagnosed with breast cancer, she opted out of going pink, saying she was highly offended by the infantilizing of women; and how one was expected to be upbeat. Anger is negative; the efforts to find a cure are made to be fun! Still, I wondered, where would AIDS research and treatment be if it weren’t for the anger of ACT UP (AIDS Coalition to Unleash Power) in the 1980s? That organization propelled the eventual success of a viable AIDs treatment. Komen’s “walk for the cure” has spread worldwide. During one BCAM, world leaders spotlighted monuments and/or historic sites, like Niagara Falls, in pink. When interviewed, someone asked, “What does lighting up Niagara Falls with pink lights mean?” It’s enough to make you gag. The efforts to find a cure started in the 1940s. It was seen as a battle. (Ehrenreich commented, “I wasn’t battling anything. I chose to live”). During World War II, members of the American Cancer Society marched in military uniforms to demonstrate the “fight against” cancer here at home while “our boys” fought enemies overseas. Back then the ratio of breast cancer deaths was 1 in 22, now it’s a shocking one in eight. Today, an astounding 59,000 women die of breast cancer each year. Ronald Reagan had pledged to invest millions of dollars into finding a cure, with very little to show for it. It became a philanthropic endeavor involving huge corporations. Yet many wonder where all the money is going. Cancer surgeon Dr. Susan Love feels that chemotherapy and radiation are poisons. She wants more research. Still, few scientists are studying the effects of pesticides, toxins, and plastics in the environment—some plastic products disrupt hormones in all species. It is a known fact that certain plastics mimic female hormones, destroying endocrine functions. Interestingly, so far, studies have included only white women, when an inordinate number of women of color, due to income disparities, live in environmentally compromised areas. Yet Komen sponsors can’t work with environmentalists because of its ties to companies whose products contain carcinogenic substances! No mention was made concerning men with breast cancer. Perhaps Polo or some other male-oriented company will step up. Now, though, men get their own week during BCAM. The Komen “cancer industry” hooked up with corporations and evolved into selling their products. That was until it was discovered that its yogurt contained bovine growth hormone. Yoplait, which the company has since stopped using, supports Komen. Revlon and Estée Lauder got on the pink bandwagon, both whose cosmetics contain carcinogenic chemicals—they promised to investigate. Avon’s Avon Foundation for Women disassociated itself from Avon Products to protect itself from the liability of its cancer-causing ingredients. During one BCAM, Kentucky Fried Chicken sold its deep-fried chicken in pink buckets (a short film clip shows Colonel Saunders in a pink suit, having switched his trademark white for the occasion), creating controversy. The hypocrisy is stunning considering that these companies whose products cause cancer purport to fight it. Sports teams signed on to BCAM realizing they could profit. Since many NFL players were not nice guys, it joined to upgrade its image, and, in my eyes, made players ridiculous with pink laces in their cleats; pink ribbon logos on helmets and other equipment. After an influential breast cancer survivor ordered herself a pink-striped Mustang, Ford held raffles for a designer Mustang, proceeds to benefit Komen. Sadly, a dozen female Ford employees who had assembled the cars’ plastic interiors, died from breast cancer. “When I see a pink ribbon,” activist Judy Brady says, “I see evil.” That’s how I felt each time Nancy Brinker, Komen Foundation founder, was interviewed, in her blush, band-box pink jacket, her robotized voice, her smooth, heavily made-up face, and her perfect hair. Pool talked to a group of women with Stage IV, or end-stage cancer, whose breast cancer metastasized. “We’re made to feel we didn’t try hard enough,” one said. Their doctors say that they can take drugs to prolong their lives. “But what kind of life would we be living?” they asked. Philanthropic foundations believe that the solution is more money. Yet there is no coordination between federal and/or private foundation cancer research organizations. And only a tiny percentage of all the Komen funds go to research (15% last year, down from 20%). Komen has cut by nearly half the proportion of funds it spends on research grants. The film was made before the Planned Parenthood controversy, in which Komen pulled its funding from that organization. Karen Handel, a Komen vice-president, and five other leaders have resigned, yet the flack continues. Would that the hundreds of thousands of people who participate could realize that they are being exploited for corporate profit. They need to get angry, organize, and speak out! They need the energy of an ACT UP. 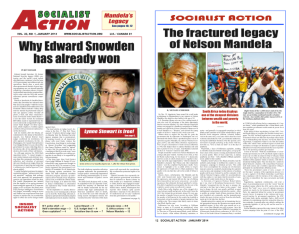 > The article above was written by Gaetana Caldwell-Smith, and is reprinted from the July 2012 print edition of Socialist Action newspaper. July 12, 2012 in Arts & Culture, Women's Liberation.